When using the roads, a cyclist is required to follow certain laws intended to ensure that cyclists use reasonable caution and safe cycling practices. When passing another bicycle or a vehicle proceeding in the same direction. When preparing to turn left. Bicycles may be ridden upon a sidewalk, but cyclists must yield the right-of-way to pedestrians and are required to give an audible signal before overtaking and passing a pedestrian. Further, official traffic control devices or local ordinances may restrict bicycles on sidewalks in some areas. Additionally, a cyclist lawfully operating a bicycle upon a sidewalk or a pedestrian crosswalk has all of the rights and responsibilities applicable to pedestrians using that sidewalk or crosswalk. A left turn by extending his/her left hand and arm horizontally. A right turn by extending his/her left hand and arm upward, or by extending his/her right hand and arm horizontally. A stop or decrease in speed by extending his/her hand and arm downward. A bicycle may not be used to carry more people than the bicycle is designed and equipped to carry. (MCL 257.658) In other words, riding “double” is prohibited. A bicycle may be parked on a sidewalk, except in places where it is prohibited by an official traffic control device. However, a bicycle may not be parked on a sidewalk in a manner that impedes the lawful movement of pedestrians or other traffic. There is no law that requires Michigan cyclists to wear helmets or prevents them from talking on cell phones while riding. However, it is obviously safe practice to wear a helmet and avoid cell phone use while riding a bicycle. 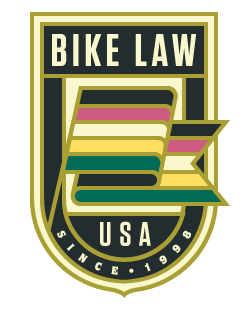 In the following “Know the Law” video segments, Grand Rapids personal injury attorney Tom Sinas talks about Michigan bicycle laws and why it’s so important for bicyclists and motorists to safely share the roads.